Everyone on the web jumped into say what was right, write, spoken, unspoken and wrong, even pop culture characters like Kelso. Regardless of whether or not Smith should've put to pen a passing conversation from between bottles, was it okay for Michael to verbalize that he was hypothetically contemplating possibly ruining a journalist's life because she wrote something Uber didn't like? Nope. And guess what? Breaking the off-the-record-cuz-we're-at-a-dinner-party code wasn't wrong, in spite of what Michael Wolff's Behind the Scenes at Uber/BuzzFeed fracas says. It makes no sense that some people are annoyed, even angry with Smith wrote. It makes even less sense that several of them are journalists, who have been in the writing trenches long enough to know that they should never ever permit scare tactics. It doesn't matter the context, dinner party or press release, there is nothing right with what Michael said. I don’t understand what’s happened with online media today where journalists are confused on where their loyalties lie. And journalists think their loyalty lies to a rich guy that they are covering, who is going to lie to them or say something horrific and illegal that damages someone’s family security, off the record and that that trumps that responsibility to the reader — I want to be very clear to any source of mine listening to this. My responsibility is to my readers. It is to the users of these services. It is not to you. Playground rules, people. Playground rules. On a gorgeous November day in 2011, I had lunch Uber CEO Travis Kalanick at Panella in Monti and over a great dish of gnocchi alla romana. A nearly 60-minute tete-a-tete, Kalanick asked me about the car service climate in Rome while I quizzed him on his Atlas Shrugged Twitter avatar. He talked innovation and opportunity, I responded with entrenched socialism, suspicious liberalization and a sleep-inducing diatribe on Rome's ongoing taxi-hired car war. 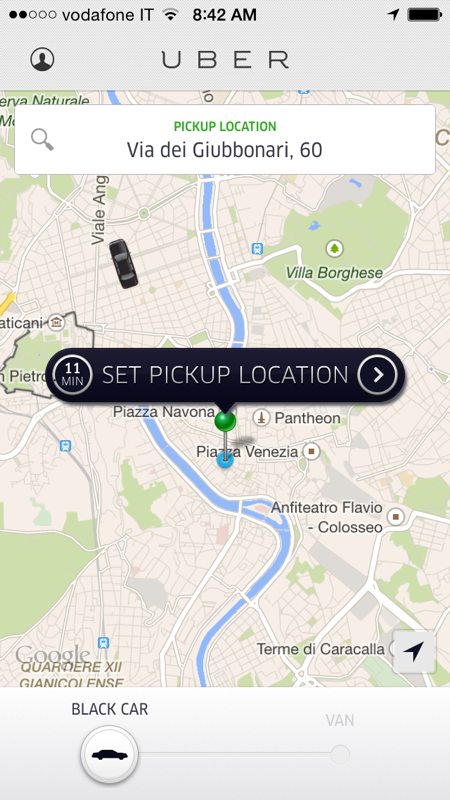 Rome, to me, was both the worst and best environment for Uber. The piquant transport war zone was stifling. There was fighting and strikes, and a freeze on taxi licenses. But on the flip, it was hard to catch a cab in the city, especially on game day. My final thoughts? Rome would be a tough market to break into so I gave him a reading list that included a Kurt Vonnegut/ Illium focus. I believe I ended conversation asking if he was subtly gunning to be a 21st century John Galt. Who is John Galt? I'm pretty sure was his response. Epilogue: Uber is in Rome (though a pale offering of infrequent black cars to Paris' uber varietal menu) and Kalanick changed his avatar.